Fall into the world of a globe trotter as they pull you from country to country in a unique culinary scene in Los Angeles Koreatown. 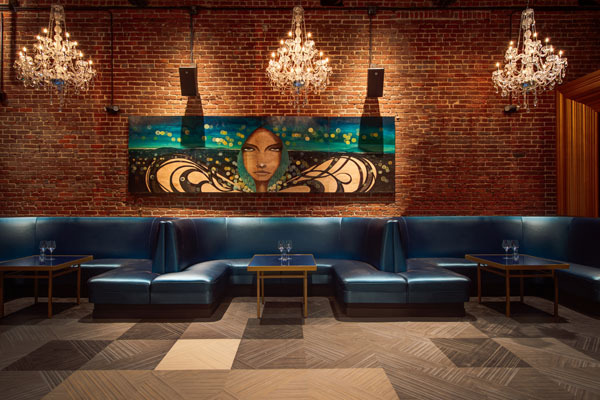 Mama Lion Supperclub boasts class, elegance and diversity—especially in the menu. Executive Chef Michael Hung, who was chef-de-cuisine at San Francisco’s Michelin-starred La Folie is known for his mastery of classic technique and his love of continental cuisine. When designing the menu, Chef Hung studied the history of clubby-old school dining destinations like Manhattan’s 21 Club and from that he established a seductive menu offering guests a delicate taste of the globe. This swanky laid back restaurant draws visitors in with the curiosity factor. 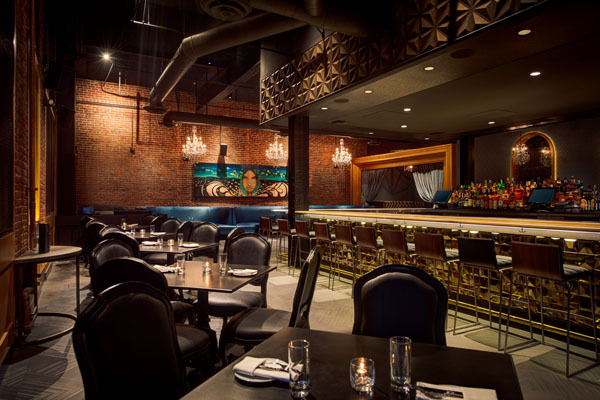 The exposed brick walls and steel pipes provides an industrial feel, however the gold accents, glimmering crystal chandeliers and royal blue velvet booths imparts affluence and exclusivity in the establishment. You can almost picture Gatsby and Wolfsheim sitting in a booth with a cigar and scotch in hand. 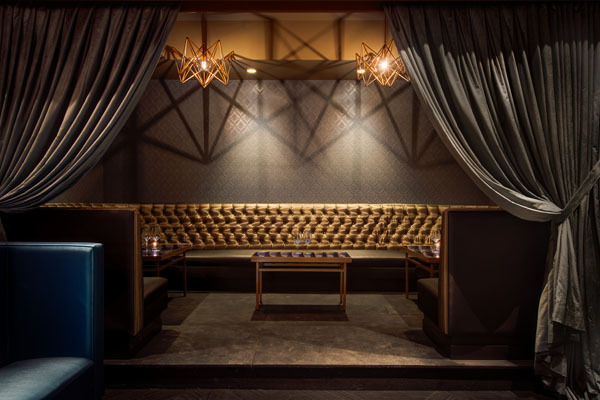 Guests can expect to satisfy cravings with snack and finger foods such as the crispy avocado samosa’s with smoked pimento ranch dressing or the beloved smothered tater tots with braised short rib ragout and aged cheddar cheese. If raw is what you’re looking for, don’t go past the oysters on the half shell or the caviar in a glitzy place like this is bound to be perfect. The shared appetizers are the hero of the night with Alaskan King Crab Cocktail on offer with avocado, tomatillo salsa, grapefruit and smoked crème fraiche. The plancha seared gulf shrimp or seafood tower will flatter all seafood lovers. For the main course, opt in for the fresh Bucatini pasta with asparagus, braised leeks and pork sausage or try Chef Hung’s elegant twist on a classic Chicken Schnitzel with accompanying salad of brassicas and greens and whole grain mustard jus. 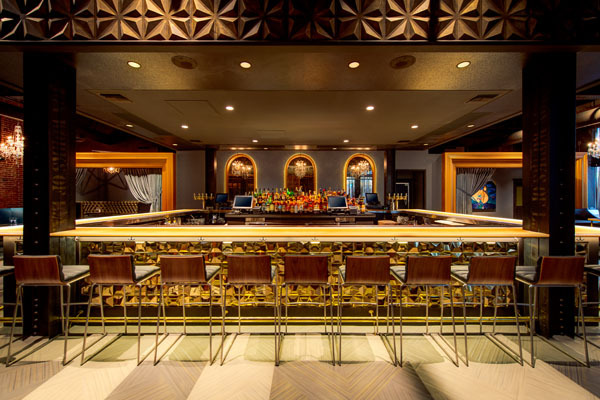 With a full bar featuring over fifty different bottles of scotch and an outstanding cocktail menu, it’s nearly impossible to pass up a drink to accompany your evening. The cocktails are just as swanky as the restaurant with offerings such as Juliana with Ketel One vodka, blueberries, cucumber, cherry liquor and fresh lime to garnish. The Sun God lives up to its name with tequila, Ancho Reyes, house-made tangerine cordial, habanero shrub, cucumber and mint. Also available is an extensive list of wines and beers, and an even more extensive list of scotches available. This glitzy new supperclub is open for dinner Tues-Fri: 5pm- 6pm and Saturday from 6pm -2am. Closed Monday and Sunday.